Broken Arrow – western TV show. Indian Agent Tom Jeffords makes friends with Chief Cochise and becomes a blood brother of the Apache. Starring John Lupton, Michael Ansara, Steven Ritch. There are 72 episodes of this western television series originally airing from 1956 to 1960. THERE IS ALSO A WESTERN MOVIE STARRING JAMES STEWART! CLICK ON THE PHOTO TO GO TO Broken Arrow – western TV show VIDEOS. 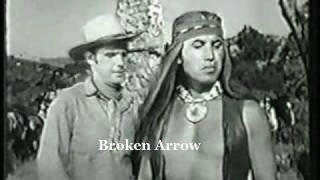 This entry was posted in Broken Arrow – western TV show, Western TV Shows Full Length and Free to Watch Online and tagged Broken Arrow, Chief Cochise, complete, free, full length, James Stewart, John Lupton, Michael Ansara, online, series, shows, Steven Ritch, television, Tom Jeffords, TV, watch, western, western TV show, westerns. Bookmark the permalink.